Carl Stahl has been developing and manufacturing top of the line wire rope assemblies and other products for the wire rope industry. In 1988 Sava Industries was acquired by Carl Stahl GmbH, as a member of the Carl Stahl group we are now part of an international network that spans across 50 companies throughout the world. We have a number of in-house capabilities that add value to our products from manufacturing services to complete design and engineering capabilities. Focusing on the customer's needs is one of our main focuses every part of our team is dedicated to bringing the best solutions to the table. 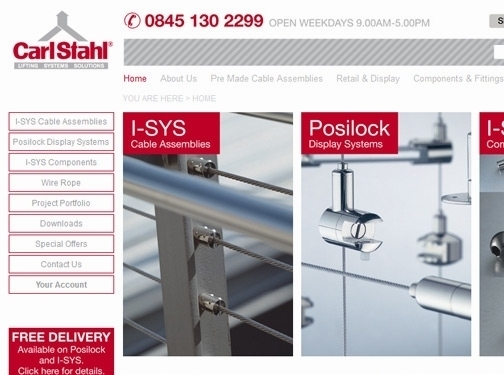 UK (Rotherham) based business - originally established in 1880 - providing cable assemblies, stainless steel wire rope, wire fittings and other products. Website includes e-commerce facilities, delivery and returns information, terms and conditions, accreditations gained, full contact details.